Attached is a new Sport Pilot Examiner Initial Course Schedule for the remainder of 2005. The course has been extended a day in order to ensure the qualifications and preparedness of the sport pilot examiner candidates. Additionally, it gives the aviation safety inspector - instructors more time to spend with the candidates in training them in the duties and responsibilities as a representative of the FAA Administrator while conducting FAA certification. Invitations to examiner candidates for Class 6 were mailed out on May 23rd. We will announce the candidates that have accepted the invitation by May 31st. We only have six examiner candidates in Class 6 because very few individuals who have received notification to take the qualification knowledge test have done so. We would encourage individuals that have received letters to take either the examiner or flight instructor knowledge test to do so as soon as possible. We are having difficulty in filling the class quotas because very few individuals have submitted the test results to the Light Sport Standardization Board. The guidance for inspectors and examiners to issue pilot privileges to those individuals who do not hold a category/class authorization on their current pilot certificate for carrying passengers in accordance with 14 CFR 61.31(k) in experimental aircraft is now available on the faa.gov web site. ISSUANCE OF EXPERIMENTAL CATEGORY AND CLASS RATING FOR THE HOLDERS OF A RECREATIONAL PILOT CERTIFICATE OR HIGHER. We have added two documents to the Sport Pilot Documents page of the Light Sport Aviation (AFS-610) web site. The first document is a powerpoint presentation that outlines Sport Pilot Flight Instructor Duties and Responsibilities. This presentation can be used to help explain to flight instructors who want to get involved with sport pilot training what specific regulations they need to review in order to comply with the new regulations. The second document is an aid for flight instructors conducting proficiency checks under 14 CFR 61.321 and 61.419. It is titled Proficiency Check Procedures for Obtaining Additional Category/Class Sport Pilot Privileges. It is very important for flight instructors to follow the procedures outlined in order to ensure that the proper paperwork is completed in a timely manner and that it is accurate. Under the provisions of 14 CFR 61.413(i) and 61.423(b) flight instructors assume a greater responsibility in FAA certification. The Light Sport Aviation Branch is proud to announce that the first Sport Pilot certificate with powered parachute privileges was issued today, March 21st, by a Sport Pilot Examiner. Larry Littlefield of Boynton Beach, FL conducted the sport pilot evaluation at Sebring, FL to Baron Tayler from Robesonia, PA. The flight portion was conducted in a Powrachute Pegasus, N4212W. The second class of Sport Pilot Examiner Candidates began also today in Sebring, FL There are eight candidates from the airplane, powered parachute and weight shift control communities. The course will be completed on Saturday, March 26th. Just to bring everyone up to date on what is happening in AFS-610. We have added spread sheet and word document on the afs600.faa.gov web site under Light Sport Aircraft Documents indicating the status of the Consensus Standards. Hopefully by April time frame we will be able to have the first set of complete standards available to certificate the first SLSA. We have also added a few additional DPEs willing to conduct sport pilot evaluations. The branch is preparing for the next two sport pilot examiner initial courses in Sebring, FL. We are also preparing for our participation at Sun & Fun. We will be located in the FAA Building to answer questions and provide information reference the various activities concerning sport pilot/light sport aircraft certification. We will have two information pamphlets on the sport pilot/light sport aircraft programs. We will be providing presentations on sport pilot certification, light sport aircraft certification, and sport pilot flight instructor duties and responsibilities in the ultralight forum area. FAA Form 8710-11, Airman Certification and/or Rating Application - Sport Pilot, is now available on ours or the FAA's main web site. It is a PDF file. Examiner and instructors are expected to use this form whenever performing sport pilot certification. Please review the application thoroughly to ensure that it is accurate when forwarding to Airman Records (AFS-760). As of the end of February 104 sport pilot tests have been taken by various applicants. A total of 52 sport pilot general knowledge tests have be administered with no failures. That is a great accomplish and reflects on the quality of the airman interested in becoming certified in light sport aircraft. The examiner availability list has been updated to reflect the additional designated pilot examiners that have added sport pilot examiner privileges to their qualifications. The next two sport pilot examiner initial courses have candidates selected and are planned before Sun & Fun. We have added the following three documents to our web site. The first document will be found under the Light Sport Aircraft Documents. The other two will be found under Sport Pilot Documents. This information was gleamed from the preamble and we find it very helpful in answering a lot of the questions we have received concerning the program. The Light Sport Aviation Branch is happy to announce that the following 8 examiner candidates have accepted invitations to attend the second Sport Pilot Examiner Initial Course to be held in Sebring, FL March 21 to 26. The sport pilot examiner list is now posted by aircraft category on the afs600.faa.gov web site. We have been receiving letters from FSDOs around the country extending sport pilot examiner privileges to existing Designated Pilot Examiners. There seems to be a growing interest by the DPEs to get involved with the program. The next Sport Pilot Examiner initial course will be held in Sebring, FL starting March 21st. Eight candidates have been sent letters asking them to participate. As soon as I am notified that they have committed to the course I will make the attendee list public. Romke Sikkema, Sebring, FL, ASEL. Attached is a photo of the first class of new sport pilot examiners. All of these newly appointed sport pilot examiners completed initial sport pilot and sport pilot flight instructor evaluations during the course. They also put in many hours studying the new regulations, practical test standards and examiner handbook. They are a credit to the light sport aviation community. We also received valuable feedback from these newly appointed examiners in helping to make the course an effective tool in preparing future examiners for their responsibilities. The Light Sport Aviation Branch would like to extend special thanks and recognize the efforts of Phil Lockwood and his staff for helping to make this a successful course. Because of his efforts we were able to certificate the first five Experimental Light Sport Aircraft (ELSA). We would also like to extend our thanks to Morris Yoder for providing his Powrachute Pegasus and Tom Peghiny for his Flight Design CT2K. It is because of the commitment of these fine individuals and organizations that we were able to meet the training needs of the initial course. The Light Sport Standardization Board will be meeting January 25th and 26th to evaluate the next large group of sport pilot examiner candidates. We will be putting the next two classes together by mid-February. The next Sport Pilot Examiner Initial course will be held in Sebring, FL starting March 21st. Invitations to attend this course will be sent to selected candidates by the end of February. We have published the information in determining sets of aircraft in accordance with the requirements of 14 CFR sections 61.315, 61.319, 61.323 and 61.415. In order for us to publish the information in table format we will need a list of aircraft in accordance with the defined sets of aircraft. Larry Burke is the point of contact for providing a consolidated list to AFS-620. The Light Sport Aviation Branch (LSSB) is having a banner week. We would like to first announce that the Private Pilot Weight Shift Control and Powered Parachute Practical Test Standards (FAA-S-8081-32)are now available on the afs600.faa.gov web site. This was a major effort to complete in a timely manner by the personnel in AFS-800 and AFS-600. Please forward any comments, questions or recommendations to afs630comments@faa.gov. The branch has made significant progress in preparing for the first Sport Pilot Examiner course in Sebring, FL. We have now MaxAir Drifter, two Air Creation weight shift control and two Powrachute Pegasus aircraft certified as Experimental Light Sport Aircraft (ELSA). This was accomplished by the outstanding support and efforts of the personnel from Lockwood Aviation, the Orlando Flight Standards District Office and the two airworthiness inspectors assigned to the LSAB. Because of their efforts we are able to qualify the inspector work force in these aircraft in order to conduct the course next week. Now we just need a little help from the weather and everything will be on tract. Attached are two photos. The first is the issuing of the first Experimental Operating Light-Sport airworthiness certificate for the MaxAir Drifter to Phil Lockwood by inspectors Al Kimball, Edsel Ford and Van Stumpner. The second photo is Martin Weaver, Manager LSAB, is taxing back in after the practical test with Larry Clymer, operations inspector LSAB, after completing the Private Pilot Weight Shift Control and Sport Pilot Flight Instructor practical test successfully. The Light Sport Aviation Branch is now ready to start accepting industry-developed training courses for light sport repairman. Individuals and/or organizations interested in submitting course materials should read and comply with FAA Order 8000.84, Procedures to Accept Industry-Developed Training For Light Sport Repairman. We are happy to announce that the following individuals have been selected for the Sport Pilot Examiner Initial Course, Class #1, to be held January 17 to 22. The Private Pilot Weight Shift Control and Powered Parachute PTS is in final coordination. We are hoping to have it available to the public by the end of January. The link for the airman knowledge tests for sport pilot will be eliminated from the AFS-610 directory. The proper directory is under the Airman Testing Standards (AFS-630) page. The knowledge test questions can be found under the Airman Knowledge Test Questions. There are two banks. One for Flight Instructor/Examiner, and the other for Sport Pilot. Hope everyone is having a great holiday season. Attached is the FAA Notice issued to the field offices giving directions for the issuance of Student Pilot Certificates to Sport Pilot Candidates. Hopefully this relieves some of the confusion in the field. We have not been able to get the policy to the field concerning the issues of a student pilot certificate for a sport pilot candidate as we had hoped by November 15th. In order to stop confusion and standardize the process the following procedures will be used in order to accomplish this task. The FAA Aviation Safety Inspector or a Designated Plot Examiner will use the appropriate chapter in either FAA Order 8700.1 or FAA Order 8710.3 that deals with issuing a Student Pilot Certificate (FAA Form 8710-2). The inspector or examiner will note on FAA Form 8710-1 the Other box in Section I "Sport Pilot". The application is processed in accordance with the current guidance. A briefing should be conducted by the inspector or examiner to the student pilot applicant as to the limitations of a sport pilot student as defined in 14 CFR 61.89(c). Additional inspectors and examiners should discuss the limitations with flight instructors that are providing training to sport pilot students. It is now anticipated that the guidance for the utilization of the new Sport Pilot Airman Application (FAA-Form 8710-11) and the appropriate endorsements will be available to the public by January. The new Sport Pilot Examiner Handbook, FAA Order 8710.7, is now available on the FAA web site (faa.gov) under the regulations and guidance link. If you follow the instructions from the November 14th e-mail reference the 8130.2F handbook it will be the second order listed. The Airworthiness Certification of Aircraft and Related Products (FAA Order 8130.2F) is now available on the faa.gov web site. If you click on the Regulations and Guidance Library it will take you to another page that has types of documents listed then click on Orders/Notices. Once you get to that page click on Current Orders by Date and the new order will be listed under 11-05-2004. Chapter 4, Section 6 has information reference the Special Light Sport Aircraft (SLSA) and Chatter 4 Section 8 covers the Experimental Light Sport Aircraft (ELSA). We will try to get this order up on the AFS-610 web site by the end of the upcoming week. We are continuing to receive applications from candidates for the Sport Pilot Examiner program. This is good for all of us. Some organizations are putting the word out that a recommendation letter from an organization "must" be included in the package. This is not a true statement. I recommendation letter is "recommended" but may come from others within the industry or FAA FSDO inspectors or examiners. The good news is that we are starting to receive a large number of applicants from Sport Pilot Examiner candidates. Unfortunately a lot of the candidates are not reading the instruction sheet thoroughly. We are having to contact quite a few of them because they have not completed the form by answering all of the questions or have not included copies of the required documents listed in the instructions. This will possibly delay these candidates from meeting the anticipated Light Sport Standardization Board starting November 29th. Please pass on to your memberships that their application and supporting documents need to be completed accurately in order for us to properly evaluate the individual's eligibility. We will try to develop a checklist and have it posted on our web site by the end of this week. We were finally able to post the airman knowledge test questions today on the AFS-630 web site under Airman Knowledge Tests. The first listing is the sport pilot knowledge test questions. The second is the private questions added to the bank for the weight-shift control and powered parachute even though it is listed as "Sport Pilot." The third is for the sport pilot instructor and designated pilot examiners. The questions shown are part of the actual bank, not all. We do not release all of the questions. I hope this helps the industry in developing the training materials to support the sport pilot program. The actual testing for all sport pilots, private weight-shift control and powered parachute, and sport pilot flight instructor and designated pilot examiners will begin December 1st. Pilot examiner knowledge test authorizations will be issued by AFS-610 only. The practical test standards are in final coordination. Our plan is to have them ready by December 1st. Our delay has been caused by trying to ensure that all the policy issues are incorporated into the PTSs. Hopefully we have finally completed the editing. The new Sport Pilot Examiner Handbook (FAA Order 8710.7) was signed by AFS-1 on October 18th. It is still in the process of being converted into compliance with new federal guidelines for handcap access. We are anticipating this to be completed within the next couple of weeks. When this is finished it will be posted on the AFS-610 web site. We are now ready to turn the Sport Pilot Examiner application process on. The new Light-Sport Standardization Board - Designated Pilot Examiner Candidate Application, FAA Form 8710-12, is now on the Light Sport Aviation Branch (AFS-610) web site afs600.faa.gov. There is a four page instruction sheet at the beginning of the application. It is imperative that candidates complete the application in its entirety in order to ensure that the application can be evaluated properly. We will only accept original application forms. The candidate is required to include copies of documents that must be contained in the package. The mailing address is on the front page of the application. Our goal is to have the first Light Sport Standardization Board during the first week of December. This is predicated on the fact that the new Light Sport Standardization Charter is signed by the Director of Flight Standards (AFS-1) before December. We are also still planning on conducting the first Sport Pilot Examiner Initial Course in January 2005. The Sport Pilot Examiner Handbook, FAA Order 8710.7, will be available on the AFS-610 web site within a week. This order has been signed by AFS-1 on October 18th. This establishes the Sport Pilot Examiner program and gives guidance to Aviation Safety Inspectors and Sport Pilot Examiners in conducting practical tests at the sport pilot level. The FAA has delayed implementation of a key element of the Sport Pilot program but EAA says we shouldn't worry. Last week the agency said it won't be able to start processing Sport Pilot student applications until at least Jan. 15, 2005, two months later than originally planned. That's the same day that the first Sport Pilot flight tests are scheduled to take place. 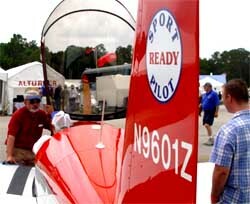 EAA spokesman Earl Lawrence said the FAA is doing its best to get Sport Pilot in gear as soon as possible. "Considering the massive infrastructure required ... we knew the schedule was ambitious and we expected a few hiccups along the way," said Lawrence. Other elements of the implementation appear to be on track and the next milestone is Oct. 15, when aircraft registration can begin. Written exams should be ready by Nov. 15 and examiner handbooks should be out by the end of October. Applications to become pilot examiners will likely be available Nov. 1. Airman Certification - will begin January 15th, 2005. The new FAA Form 8710-11, Airman Certificate and/or Rating Application - Sport Pilot will be available January 1st, 2005. AC 61.65, (revision) - Certification: Pilots and Flight and Ground Instructors - is estimated to be available January 2005 to provide policy and guidance to flight instructors for conducting proficiency checks and endorsement requirements. FAA Order 8710.X, Sport Pilot Examiner Handbook - is estimated to be available in late-October to establish the Sport Pilot Examiner program. FAA Form 8710-12, Light-Sport Standardization Board - Designated Pilot Examiner Candidate Application is estimated to be available by November 1st. "...We have been receiving a lot of phone calls and e-mail messages asking about the above issues. Unfortunately we have had some enthusiastic instructors trying to conduct proficiency checks before the system is in place. As everyone knows the more informed we keep the public with timely information the better it will be for the entire program. Please feel free to call if you have any concerns or questions..."
1. What are the Milestones for implementation of the final rule? The FAA will post an implementation plan for the rule on the FAA Sport Pilot and Light-Sport Aircraft Website, http://www.faa.gov/avr/afs/sportpilot or http://AFS600.faa.gov. The plan will contain milestones for completion of the specific guidance, policy, and infrastructure necessary for the public to conduct operations and seek certification under the new regulations. Below are some of the major milestones. An FAA certificated pilot can exercise sport pilot privileges while operating an FAA certificated aircraft that meets the definition of a light-sport aircraft. That pilot can use either a valid third class medical or a current and valid U.S Drivers license to meet the medical eligibility requirements. Unregistered/un-certificated transitioning ultralight-like aircraft can apply for an “N” Number (Aircraft Registration). Education focusing on Sport Pilot Flight Instructor privileges and responsibilities; registering and maintaining light sport aircraft. 2. When will the FAA be ready to begin accepting applications and issuing new airman certificates or new airworthiness certificates under this rule? The FAA will accept applications, FAA Form 8710-11, for a student pilot seeking a sport pilot certificate, sport pilot certificate, flight instructor certificate with a sport pilot rating, and FAA Form 8610-1, for a repairman (light-sport aircraft) certificate. Additionally, the FAA will begin processing applications, FAA Form 8710-11, for additional sport pilot or sport pilot CFI category or class privileges. Applications, FAA Form 8710-11, for the new Private Pilot certificates with a weight-shift control or powered parachute ratings will also be accepted after this date. The new FAA Form 8710-11, Airman Application and/or Rating – Sport Pilot, will not be made public until January 15, 2005. FAA Form 8610-1 is currently available, but the policy for the repairman (light-sport aircraft) to complete the application is not. The FAA will not accept any applications for this new repairman certificate that are submitted prior to this date. The FAA will accept FAA Form 8130-6, Application for US Airworthiness Certificate for the issuance of an experimental light-sport airworthiness certificate or a special light-sport airworthiness certificate. EAA work on sport pilot/light-sport aircraft cleared the way for many pilots to use their valid state driver’s license to satisfy the medical requirements. According to the final rule published on July 27 in the Federal Register, only pilots whose most recent medical application was not denied, revoked, or suspended are allowed to use their driver’s license as proof of medical certification. The effective date of the rule is September 1, 2004. Those who wish to verify what the FAA has on record regarding their medicals can contact their Regional Medical Office of the Aerospace Medical Certification Division. Pilot name, Social Security number, and date of birth are required to run the check. For a listing of the FAA regional offices, visit www.cami.jccbi.gov/AAM-300/rfs.html. This morning at about 10:30 AM eastern time, to a room full of press and ultralight organization representatives (including USUA EVP Dale Hooper), the Sport Pilot/Light Sport Aircraft rule was officially announced by FAA Administrator Marion Blakey. Describing this new rule as "really great news", Ms. Blakey went on to say that "effective September 1st, the FAA begins to certify Sport Pilots, and their aircraft. This Sport Pilot/Light Sport Aircraft rule reduces the barriers to becoming a pilot and an aircraft owner while assuring that safety will always be the priority." An over view of the rule was given by Administrator Blakey, Ron Wojnar (Deputy Director, Aircraft Certification Service) and Jim Ballough (Director, Flight Standards Service), followed by a brief question and answer period. The official FAA Press Release, describing more details can be found at FAA News. According to the rule, Light Sport Aircraft are: airplanes, gliders, gyroplanes, balloons, airships, weight shift control (trikes), and powered parachutes. Helicopters and powered lifts are excluded because of complexity. Outside, on the sidewalk of 800 Independence Avenue (home of FAA Headquarters) was displayed an Airborne Trike (owned by Wayne Kerr- USUA 80468), A Kitfox IV (owned by Doug Kelly), and a Powrachute Pegasus (owned by John Yonkin- USUA 83730). As to be expected, these airplanes drew much attention, and caused quite a stir in downtown Washington DC. After the press conference, a photo session was held featuring these Light Sport Aircraft type airplanes. Administrator Blakey tried them all on for size. It is anticipated that there will be press conference tomorrow Tuesday, 10:30 AM, at 800 Independence AVE, Washington, DC to announce the new Sport Pilot Rule. In addition the new rule should be published in the Federal Register on Tuesday 7/20/04. USUA is pleased to announce that after months of evaluation, the Sport Pilot/Light Sport Aircraft Rule has been signed by the White House Office Of Management And Budget (http://www.whitehouse.gov/omb/library/OMBREGSC.html#DOT), and preparations have already begun by FAA for it's release sometime next week. As was reported earlier by USUA Headquarters, the final rule will look different than the NPRM, which was published in the Federal Register Feb. 5, 2002. Meetings are scheduled between FAA, USUA, EAA and ASC to discuss the final rule, and the implementation procedures involved. No details concerning any changes are available at this time. In the coming weeks, USUA members with questions concerning the specifics of the final rule can look to the USUA website for updated information , and USUA Regional Representatives will soon be supplied with detailed materials to help members and clubs with localized support. USUA will provide access to materials and support for all members who choose to participate in Sport Pilot. The release of Sport Pilot is only the beginning. There will be a period of time before the rule is effective, which will allow prospective Sport Pilots, the opportunity to position themselves for participation. It will also allow for the creation and registration of Sport Pilot instructors and examiners. Instructors desiring involvement on these levels will soon be provided the opportunity to do so. In preparation for this rule, USUA urges all members who have not yet done so, to register as ultralight pilots. If you are in the process of becoming a BFI, finalize that registration soon. These ultralight registrations will allow you to take advantage of special transitional provisions FAA has put in place for registered ultralight pilots and instructors wishing to participate in Sport Pilot. After so many months of preparation, USUA applauds FAA in their continued dedication to this project, which will allow USUA members yet another option to "Fly For Fun". Sport Pilot Rule Clears Final Hurdle! A bright new age of aviation participation is ready to unfold, capping a decade of effort by the Experimental Aircraft Association and the aviation community, as the highly anticipated sport pilot/light-sport aircraft rule has cleared its last governmental hurdle. The White House Office of Management and Budget (OMB) released the rule to the Federal Aviation Administration, the last of many federal approvals that were necessary before this major rule could be published. The regulation, commonly known as the “sport pilot rule,” is now ready for publication in the Federal Register within several days. It gives aviation enthusiasts a way to focus on the basics of flying by lowering costs while enhancing safety and security considerations. The light-sport aircraft portion of the regulation, meanwhile, opens the door to more affordable aircraft. The FAA is expected to announce the Sport Pilot and Light-Sport Aircraft final rule next week. It is expected to allow certificated pilots who no longer have current medical certificates to fly again in low-performance aircraft—such as some Piper J-3 Cubs—by using a valid state-issued driver's license to meet the medical requirement. What remains to be seen is when the rule would actually go into effect. Once it does, previously certificated pilots should be able to fly immediately under more limited sport pilot rules. For more about the initiative, see AOPA Online. When the Aero Sports Connection (ASC), a membership group for sport flyers and ultralight pilots, sent out a letter last week to its registered ultralight instructors asking them if they want to become FAA Designated Pilot Examiners (DPEs) in the proposed Sport Pilot category, it opened a can of worms -- which may be only the first of many such cans lying in wait, as the long-anticipated Sport Pilot rule, with its multitude of devilish details, creeps toward finalization. "We need to get started on this," ASC President Jim Stephenson told AVweb yesterday. "We have over 2,400 instructors, and we'll have to have examiners to give them check rides." But to some, the action seemed premature. The letter asked instructors to submit information to the ASC about their background and experience. "This is our own internal process," Stephenson said. About 5 p.m. Tuesday, a teleconference with EAA, the ASC, the FAA, and the U.S. Ultralight Association (USUA) was held to clarify the procedure for authorized ultralight instructors to become DPEs in the proposed Sport Pilot category. "FAA emphasized that, contrary to some reports, the application process has NOT started and that no action to start the DPE process would begin until a final Sport Pilot/Light-Sport Aircraft rule is published in the Federal Register and subsequently the DPE policy is released," EAA said on its Web site Tuesday night. Stephenson said that his letter to instructors was "fully compatible and coordinated with the FAA process." On the ASC Web site, an announcement is posted regarding Sport Pilot Examiners: "The Sport Pilot program requires many pieces of infrastructure. ... One of those pieces is a set of examiners who are competent in these light craft. A transitional plan is now starting to identify and train a significant number of examiners from our ranks. The first step in this plan is to send a letter to all BFIs and AFIs [basic and advanced flight instructors] to see who wants to be an examiner. ... Those who wish to be considered will supply background and experience information to aid in the evaluations. Once ASC has recommended candidates for SPE [Sport Pilot Examiner], the FAA examiner evaluation board will select from the pool of available candidates." The confusion seems to have arisen from two separate provisions in the expected Sport Pilot rule. While only the FAA can designate a DPE, the major ultralight organizations -- ASC, USUA, and EAA -- may endorse applicants, and that endorsement, although it is not required, will add to the value of the application. It was that endorsement process that the ASC was trying to get a jump-start on, Stephenson said, so it would have a pool of qualified applicants ready to go when the gate opens. USUA Director Jim Sweeney said that his organization also encourages its registered flight instructors to consider becoming a Sport Pilot DPE or CFI. "It is critical that we have as many Light Sport DPEs and CFIs that are knowledgeable and competent with ultralight aircraft as possible [to] participate in these programs," Sweeney said in a e-mail to AVweb yesterday. The USUA also said it will provide its members with "accurate information regarding Sport Pilot and the regulatory process as it becomes available." In the teleconference, the FAA said all applications from DPEs must be made on FAA application forms, which are to be available in due time on the FAA AFS-610 Web site. There will be no fees charged by the FAA, nor is there any plan to require a potential applicant to work through any organization. The confusion is not completely unexpected -- some in the ultralight community have long been somewhat dubious whether the complex Sport Pilot rules will make flying in any way better for them, with the instructor issues high on the list of concerns. Nonetheless, both the ASC and the USUA are actively supporting the rule. "Giving our pilots and instructors more options, an FAA certificate, and the ability to fly for fun and recreation in the planes that they want to fly has always made sense," Stephenson says on the ASC Web site. The USUA, on its Web site, acknowledges that the transition for some ultralight flyers may be "difficult and expensive," especially if they don't act quickly enough to take advantage of transition provisions in the new rule, but nonetheless supports the rule overall. EAA has always been a staunch advocate for the proposal. At 5PM, Tuesday June 29,2004, USUA EVP Dale Hooper participated in a teleconference with FAA EAA and ASC, discussing the Sport Pilot DPE registration program. Reports of inaccurate information that have recently been circulated throughout the industry, prompted FAA to call this meeting in order to clarify the registration process. First, it must be clear that the process has not yet begun. Sport Pilot has not been signed, and no action can be taken regarding any of the particulars of the final rule, until it has been published. At that time, DPE applicants will be able to download an application from the FAA AFS-610 website. This FAA application will be the only document considered as authorized for registration. DPE registration is open to anyone, regardless of organizational affiliation. In fact, no affiliation is required for application. If the applicant is a member of one of the major ultralight organizations (USUA, EAA, or ASC), they may obtain an endorsement from that organization. This endorsement will add to the value of the application. USUA will provide accurate information regarding Sport Pilot and the regulatory process as it becomes available. The sport pilot/light-sport aircraft rulemaking package has been returned to the Office of Management and Budget (OMB) for final approval. OMB’s website acknowledges receipt of the rule on June 1, 2004. No deadline for final action is listed on the website. However, when EAA Vice President of Government and Industry Affairs Earl Lawrence visited OMB, along with fellow ASTM Committee chairmen Phillip Lockwood and Eric Tucker, they stressed the need for swift approval of the rule. The rule, which had been withdrawn from the Office of Management and Budget by FAA in late March, is now back at OMB for what is hoped to be the final review before publication. FAA had withdrawn the rule to answer questions presented by OMB, in a procedural move that would keep the rule on-track instead of creating a major setback if it was completely rejected by OMB. This advancement is another major step forward for the rule. Once OMB approves the rulemaking package, it will be returned to FAA for publication in the Federal Register. This year’s AirVenture event will include a major focus on sport pilot as it provides an exciting opportunity for growth in many areas of the aviation community. EAA will continue to monitor the rule’s progress and report any news as soon as it’s available. EAA’s efforts to finalize the sport pilot/light-sport aircraft rule drew the support of seven members of Congress this week, as these elected officials were invited to join EAA members and aviation enthusiasts in urging the Office of Management and Budget (OMB) to approve the rule “in the most expeditious manner possible” when it receives the proposal back from the Federal Aviation Administration and the U.S. Department of Transportation. The elected officials, who are also pilots or knowledgeable aviation supporters, include Senators James Inhofe (R-OK) and Michael Crapo (R-ID); and Congressional representatives Sam Graves (R-MO); Tom Petri (R-WI); Robin Hayes (R-NC); Vernon Ehlers (R-MI); and Dennis Rehburg (R-MT). Each signed the letter addressed to OMB Director Joshua B. Bolten, expressing strong support for the FAA’s proposed rule, Certification of Aircraft and Airman for the Operation of Light-Sport Aircraft (Docket No. FAA-2001-11133). Join the Sport Pilot Petition Drive Now! In less than a week, thousands of EAA members and other aviation enthusiasts have signed a petition to the federal Office of Management and Budget urging it to expedite release of the proposed sport pilot/light sport aircraft rule when it returns from FAA in the next few weeks. This rule is a huge step for those who are looking to overcome personal time or financial burdens that keep them from pursuing their aviation dreams, or for those who want a viable way to return to the sky. If you haven’t made your voice heard, do it now. Join the petition drive in less than two minutes by visiting the EAA website. This petition will go directly to the OMB as a show of support from the aviation community for the opportunities available through what’s commonly known as the “sport pilot” rule. The FAA says it will have a revised version of the Sport Pilot/Light-Sport Aircraft Notice of Proposed Rulemaking (NPRM) in front of the Office of Management and Budget (OMB) in the next week or so. FAA spokeswoman Allison Duquette told AVweb Wednesday that the goal is to get the rule out "as soon as possible." About three weeks ago, the FAA withdrew the NPRM from the OMB, which must sign off on it, after the OMB raised concerns about parts of the proposed rule. The hang-ups have never been made public. "I can't discuss that because we are in rulemaking," said Duquette. She said she doesn't know how long the OMB will need to assess the revised NPRM but it has not placed any time limits on the process. On March 24, 2004, it was officially announced that FAA had requested that the proposed Sport Pilot rule be returned from the Office Of Management & Budget, to FAA. This action was taken by the Administrator to address issues that seem to have been of concern to OMB. The rule was not sent back by OMB, as was erroneously announced days earlier at an industry Safety Seminar, but was withdrawn by FAA request. By withdrawing the rule by FAA's own request at this time, it could save the rule from being rejected by OMB, and keep it from having to pass through the entire regulatory process once again -- possibly avoiding a rewrite or worse. USUA applauds FAA for taking this action. This decision will eventually help expedite the Sport Pilot/Light Sport Aircraft regulations, allowing those anxiously awaiting the final rule the opportunity to participate in this long awaited program. Manufacturers, dealers and pilots of aircraft that will be affected by these rules have endured difficult times throughout the process, and any effort to bring this matter to fruition is welcome. USUA will stay on top of the ongoing situation, and provide more information, as it becomes available. As stated before, USUA will only report verifiable information from FAA sources. USUA received a phone call at 10AM EST from Sue Gardner of FAA informing us hat late yesterday afternoon, the Secretary of the Department of transportation has signed off on the proposed Sport Pilot/Light Sport Aircraft Rule. It now goes to the Office of Management and Budget, the final step in the rulemaking process. OMB is expected to use their allotted 90 days to evaluate the rule and act accordingly. If all goes well, and there is little to expect otherwise, we may see SP/LSA sometime after April 2004. "This is great news for our community," says USUA EVP Dale Hooper, "USUA members who have not yet registered as ultralight pilots, are encouraged to do so immediately so that the special provisions allowed to persons holding this registration may be taken advantage of." USUA will continue to monitor the development of these proceedings and encourages all members to visit www.usua.org for any and all news and announcements. The FAA announced this week that funding has been approved to establish a Light-Sport Aircraft (LSA) Operations Program Office for implementing the pending sport pilot/light-sport aircraft final rule (SP/LSA). The office will be set up as a branch within the Regulatory Support Division in Oklahoma City, Oklahoma. When the final rule is announced, it will initially require the FAA to certificate an existing fleet of an estimated 10,000-plus uncertificated aircraft and airmen using a standardized methodology. The LSA office will provide the policy guidance and infrastructure for both industry and FAA field offices; program oversight; and continued standardization of this program, from the effective date of the SP/LSA rule and into the foreseeable future. Over the next 10 years the FAA expects more than 12,000 new pilots to seek sport pilot certificates and purchase new LSA. This will be in addition to the many private pilots that left flying for financial or other reasons who will re-enter general aviation as a result of the new rule. The new set of regulations is also expected to generate an additional 9,000 repairmen over the course of the next 10 years in addition to 9,000 people who will apply for certification in the first three years. The new office’s responsibilities will include developing and providing designee training (DPE/DAR); developing and maintaining Pilot Practical Test Standards and knowledge test item banks; approving and monitoring industry training for sport pilots, sport pilot CFIs and light-sport repairmen; and providing a data repository for light-sport information. FAA’s sport pilot team attending the ASTM (American Society for Testing and Materials) International meetings in Florida on January 28-29 reminded the industry and community that the transition process for ultralight pilots and instructors will offer the simplest path for individuals wishing to become sport pilots or sport pilot instructors. As proposed, ultralight pilots who are registered with EAA, AeroSports Connection (ASC), or the United States Ultralight Association (USUA) will be able to transition readily to sport pilot status.. The ASTM International Light-Sport Aircraft (LSA) Committee wrapped up its winter meeting work mid-afternoon on Wednesday, January 29.In early morning sessions, both the Fixed-Wing and Weight-Shift subcommittees continued to refine various standards they have in process. Good progress was made on resolving a number of negative issues on those standards, and both groups are optimistic they’ll have design standards ready for use by the time FAA completes the final rule. FAA sport pilot team manager Sue Gardner assured the ASTM International Light-Sport Aircraft Committee Tuesday, January 28, that FAA resources continue to focus on meeting the congressionally mandated September 2003 deadline to take action on the sport pilot/light-sport aircraft rule. Gardner briefed the 60 committee members during the first day of a two-day meeting at the Fantasy of Flight Museum in Polk City, Florida. The meetings are centered on creating the consensus standards for light-sport aircraft (LSA), which are being worked on alongside the final rule. 2:30 - 4:00 EAA Forum, Sport Pilot…What’s Happening Now? time limit on use of converted ultralight trainers for instruction, and eliminate the 87-knot speed restriction for student Sport pilots. Sport Pilot word is to be published in Federal Register on Feb 5th. Closing date to be May 6th. Expected to have the document available on the FAA web site today. Trying to get the data up on the web site now. will be plenty of comments for the FAA folks to sort through. The NPRM contains no big surprises -- the main components have been hashed out bit by bit at many FAA briefings over the last few years. 39 knots, maximum airspeed of 115 knots, and fixed landing gear. Among currently certificated aircraft, J3 Cubs, Aeronca Champs and Chiefs, and early-model Taylorcrafts would likely qualify. Either an FAA medical certificate or a U.S. driver's license would make you good to go. The FAA estimates 10,000 existing aircraft will be certified and 10,000 people will become certificated sport pilots and flight instructors. questions that the FAA will ask regarding the proposal. The FAA said it will publish a notice in the Federal Register shortly with details. FAA officials confirmed on Friday, January 4, 2002, that the Office of Management and Budget (OMB) has approved the long-awaited sport ilot/light-sport aircraft rulemaking proposal, clearing the last hurdle for the proposal to be published as a notice of proposed rulemaking (NPRM). The NPRM will likely be published in the Federal Register during the week of January 7, FAA said, with a 90-day public comment period to follow. FAA officials called OMB's approval of the sport pilot proposal "a great start to the new year," and thanked EAA for its efforts in keeping the proposal moving through the regulatory process. Upon learning of OMB's approval, EAA President Tom Poberezny said, "Our efforts to see this rulemaking proposal reach the public comment stage have paid off. The support of FAA, the Department of Transportation, and OMB for this rule is significant. We look forward to the final rule's passage and the boost it will provide to all facets of sport and general aviation." FAA sources tell AOPA that the long-anticipated Sport Pilot-Light Sport Aircraft proposed rule will "hit the streets" next week, barring any last-minute glitches. The FAA will publish a notice of proposed rulemaking (NPRM) to allow the public to comment on the rule. The proposal would regulate aircraft that are too large to be ultralights, but too small to economically meet current FAA certification standards. It also proposes a sport pilot certificate that could be obtained with about 20 hours of training and that would allow pilots to operate these aircraft with either a third class FAA medical certificate or a valid driver's license. "AOPA congratulates the Experimental Aircraft Association on its efforts in working with the FAA and the industry to obtain the release of this proposal," said AOPA President Phil Boyer. "AOPA applauds any initiative that serves to lower the cost of learning to fly, and the continuing enjoyment of flight activity. The association will carefully evaluate each provision of the proposed rule once it becomes public, and will offer comments to ensure that safety is not compromised while maintaining a reasoned approach to sport aircraft and pilot certification." AOPA will post the rule on AOPA Online as soon as it becomes public and will provide a message area so that members can send their comments on the proposal directly to the FAA. After months of waiting, debating and deliberating, the much-anticipated Sport Pilot/Light Sport Aircraft Notice of Proposed Rulemaking (NPRM) should truly now be "sitting at the hangar door ready to taxi." AVweb faithful will remember those were the words used by DOT Secretary Norm Mineta back in July at EAA AirVenture 2001. Mineta told the standing-room-only crowd at the "Meet the Administrator" session that the new pilot certificate -- nearly nine years in the making -- was close to becoming a reality. Unfortunately, that turned out to be "close" in dog years, not human years. The snail's pace is not surprising, though. The proposal means changing eight different parts of the FARs and it has the potential of adding thousands of new pilots to the ranks -- which has the potential to do wonders for national paranoia. In addition, the rules will create new opportunities for manufacturers who build aircraft that fit the Light Sport Plane category (read: many ultralight and kitplane manufacturers). The Office of Management and Budget (OMB) had returned the proposal to the FAA for additional information about the large economic impact when September 11 dawned, and everything not having to do with national security went from fast track to off the tracks. The FAA has since returned the proposal to the OMB with answers to their questions. After getting the OMB's seal of approval it will, according to EAA, travel back to the DOT for another sign-off. Only then will it head to the FAA for publication as an NPRM in the Federal Register. Once that occurs, you can have your say on it for 90 to 120 days. All the comments received will be taken and sifted through to create a final version of the new Sport Pilot/Light Sport Aircraft rule. NOTE: For more on what the NPRM will likely include, visit AVweb's NewsWire at <http://avweb.com/n/?01a>. At the close of 2001, status of the much-anticipated, often-delayed notice of the Sport Pilot/Light-Sport Aircraft proposal is about the same as it was six months earlier at AirVenture Oshkosh: "Sitting at the hangar door, all set to taxi," as described by Department of Transportation Secretary Norman Mineta. At that time sport pilot, one of the most significant aviation rulemaking efforts in years, was being reviewed at the Office of Management and Budget (OMB), but it was returned to the DOT with some questions about budgetary impact. As the FAA was working to address OMB's questions, priorities were suddenly and violently altered by September 11 and sport pilot was set aside. Several weeks before the end of the year, movement resumed when answers to budgetary concerns were provided and forwarded to OMB, where it again awaits approval. Once OMB approves and returns sport pilot to FAA, an NPRM will be published in the National Register allowing for public comment. If approved as proposed, sport pilot will establish a new pilot certificate, "sport pilot," and a new aircraft category, "light-sport aircraft." Many expect sport pilot to have a huge impact on aviation, allowing more people to experience the freedom of flight than ever before.